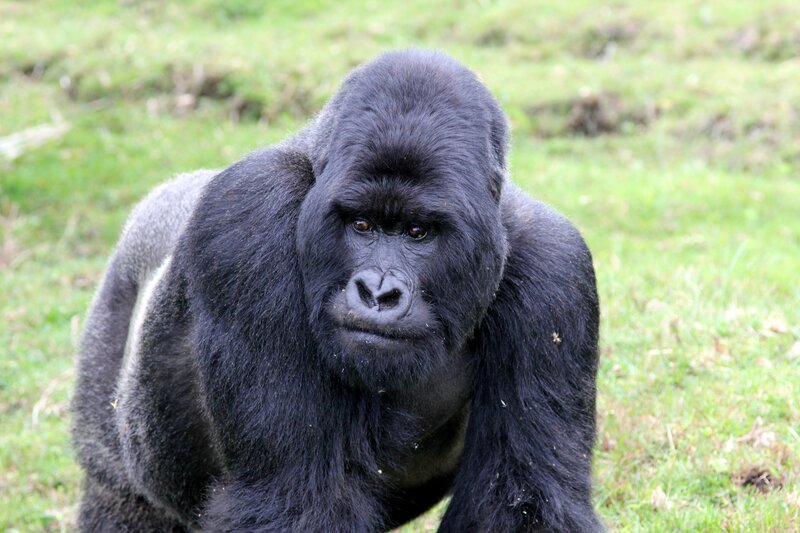 Rwanda is the “land of a thousand hills”. I think there are actually five thousand, but either way, it’s beautiful. Even the capital city, Kigali, is stunning. It’s the cleanest, greenest and most organized, traffic free capital I’ve been to in a long time. The last Saturday of every month in Rwanda is Umaganda. I’m not sure what the exact translation is but it’s basically a half day of community service from 7am to noon’ish. 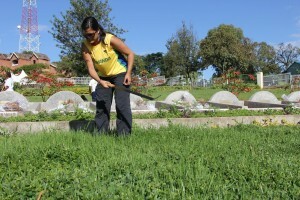 The mayor of the village chooses the project and everyone works together on it. Everyone participates. And I mean everyone. Businesses close around the country. Rwandans have a card that gets stamped for each Umaganda they participate in. And if you miss one there is a small fine. Josh and I were thrilled to be there for Umaganda in May. NDI and the governments Political Party Forum organized an Umaganda for the 81 NDI young political trainees we were there to teach as well as us. Even a couple of Members of Parliament came, rolled up their sleeves and dug in like the rest of us. 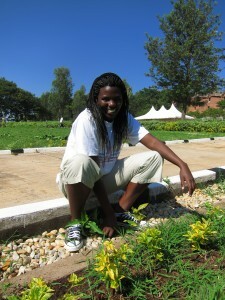 For our Umaganda we cut grass (by hand with a machete-like implement), pruned and picked up rubbish at the Rebero Genocide Memorial Site where 14,400 Rwandans are buried from the 1994 genocide. Most of those buried at this site were political party activists or leaders and their family members. While working, a new friend told me that her four year old sister and parents were buried there. Where we were pruning. Many people believe that Umaganda is what has kept Rwanda so clean as many projects are centered around clean-up, though the project could be anything including building houses for the poor. But many others, including me, are struck by the power that Umaganda has to bring a community together, every month, and work side by side. When the children of the people that killed your family are living and yours are dead it takes something pretty consistent and powerful to bring people together. 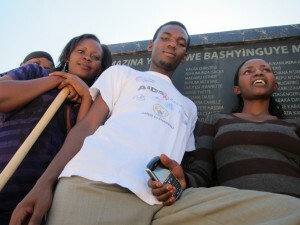 I’m not sure that Umaganda is the only answer, Rwanda is doing a lot of things right, but it’s gotta help. Normally, when I’ve done work for NDI in the past I share campaign tactics and strategies. That was no different in Rwanda, however, the country’s history did pose a unique challenge because it was, in part, political parties that propagated the hate between Hutus and Tutsis that led up to the genocide in 1994. So, political parties and even the word “ideology” are thought of hand-in-hand with the genocide. When my assigned political party for the training wanted their plan to fundraise in order to train party members about democracy, I challenged them. Where’s the contrast? What makes you different from other parties? But then I understood… Before you can convince someone that your party is the right one for them, you need to first teach them that politics and political parties are once again safe. Literally. I digress from Umaganda but I think in the 17 years since the horrific genocide no one in the West imagines Rwanda to be the beautiful, safe, organized and welcoming place it is today. And it is. And things like Umuganda are making it happen. If you’ve ever thought about going to central or east Africa come here. See this country. Talk to Rwandese people. And stay for an Umaganda. You’ll be glad you did. 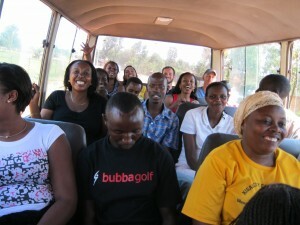 Riding with a bus load of students after Umaganda.